February 02, 2015, 12:55 p.m.
Conservatives are against "big government". They tend to think of government as a problem, not a solution. In this, they are out of step with the expectations of the British people, as a new YouGov poll for Red Box makes clear. We asked: "People sometimes talk negatively about &apos;Big Government&apos;, seeing it as an inefficient bureaucracy that intrudes on people&apos;s lives. But we also want the government to run great services, provide security and help grow the economy. Ignoring whichever party happens to be in power, how do you balance these two opinions? 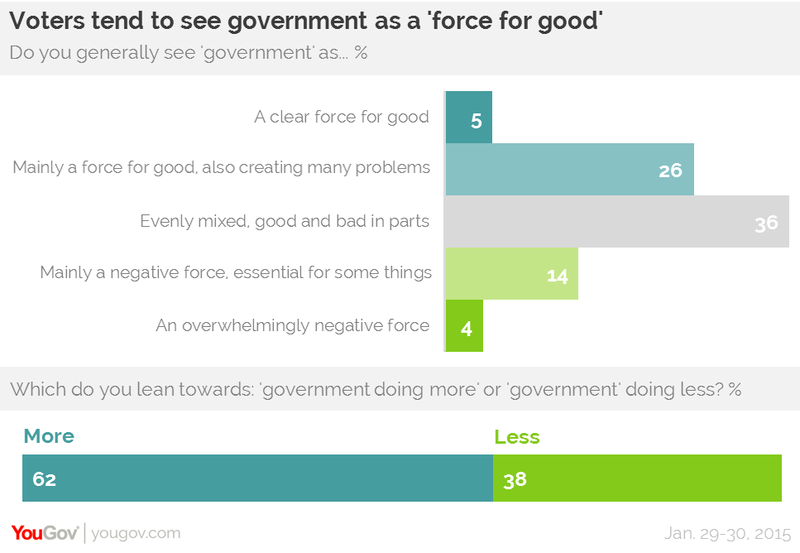 Do you generally see &apos;government&apos; as..." &apos;mainly a force for good&apos; (31 per cent) or &apos;mainly a negative force&apos;?" (17 per cent, with 36 per cent saying &apos;evenly mixed&apos;). Finally we asked: "On the whole, reducing this huge and complex issue to a forced choice of just two words, which do you lean towards: &apos;government doing more&apos; or &apos;government&apos; doing less?" "More" won by an overwhelming 62 per cent to 38 per cent. Until Conservatives develop and communicate a programme of better and purposeful government, and not just a schedule of economically necessary "cuts", they are unlikely to win a full mandate from the electorate.